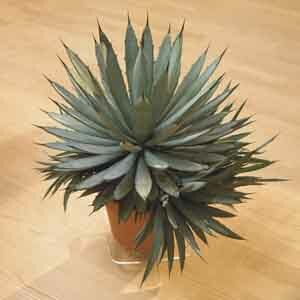 Rosette of long, gray-green succulent foliage is a stylish accent plant for any sunny situation. Spiny edges add interest and texture. A low-maintenance selection, perfect for beginners or anyone seeking a great-looking, sculpture-like plant that doesn’t a lot of work. Native to Mexico. A carefree houseplant for a sunny location or in a container outdoors during warm weather. A wonderful easy-care gift plant! Apply liquid fertilizer 2 or 3 times during growing season. Prefers very well drained soil. Allow soil to dry moderately between waterings. Start with a good quality, commercial potting soil for Cacti and Succulents. That will ensure that the soil is sterile and pest-free. Many are available with a mild starter fertilizer in the mix. If you choose to make your own soil mix, combine equal parts sand and general purpose potting soil. Prepare the container by filling with potting soil up to 2” (5cm) from the rim of the planter. Make a hole in the center of the soil large enough to hold the root ball of the plant. If the plant is spiny be sure to wear gloves for protection. Rubber gloves should be fine if handling small-spined plants but if the plant has long or sharp needles, leather gloves offer more protection. Small plants may be safely moved using kitchen tongs. For moving larger plants, a good method is to wrap the plant with paper towel or tissue paper. For exceptionally large or spiny plants follow with a layer of newspaper or wrapping paper for extra protection. Wrap gently, not too tight, so as not to crush the spines. Tape the outer layer of paper closed at several points to hold snug. Once the plant is moved to its new pot and secure, then the wrappings can be carefully removed. Remove the plant from its pot. Place it in the planting hole and press soil firmly around the roots, just covering the root ball. For spiny plants, use a stick, spatula, or other utensil to move the soil and to keep distance between your hands and the spines. Repot every 2 years. Unless the roots are pot-bound the same container can be used. If a larger pot is needed choose one not more than 1-2” (3-5cm) larger in diameter than the existing pot. Apply water at the soil level if possible to avoid wetting the plant. Water the entire soil area until water runs out the base of the pot. This indicates that the soil is thoroughly wet. Discard any excess water that has accumulated in the pot’s saucer. Don’t water again until the top 1-2” (3-5cm) of soil is completely dry. Check the soil moisture with your finger. Plant may require less water during the winter months when it’s growing more slowly because of lower light levels. Some species may even go dormant for a few months in winter. Fertilizers are available in many forms: granulated, slow-release, liquid feeds, organic or synthetic. Determine which application method is best for the situation and select a product with a nutritional balance designed for cactus and succulent plants. A general-purpose fertilizer for house plants can be used for feeding cacti or succulents but it must be diluted to one quarter the strength of the normal rate. Cactus and succulent plants can be pruned to remove dead or damaged parts or to maintain a specific size or shape. Pruning encourages new growth, branching, and provides plant pieces that can be used for propagating more plants. Keeping the plant trimmed also encourages more side-shoots and reduces the demand for the plant to develop a larger root system. This is important since the roots are in a confined space. Depending on the growth habit of the plant: long succulent leaves can be cut back to the base of the plant. Side stems can be cut back to the main trunk. If trimming to shape, cut off smaller segments just above a joint. Baby cacti that grow on the main plant are known as “pups”. They can get very thick on some types of cacti. Pups can be cut off with a sharp knife at a 45-degree angle. Allow the cut area on the pups to air dry until a callous forms and they can be set in moist sand to root and eventually form new plants. Some cacti and succulents produce “offsets”. These are plants that grow next to the mother plant by short rhizomes. These can be cut off at the rhizome and used to start new plants just like pups.